Everyone was hoping for a great battle for the title between the two Mercedes drivers, but it didn’t happen, Rosberg suffered an ERS failure and ended up finishing just 14th. However even without that failure a fight for the title was unlikely, Hamilton had to finish third or below for Rosberg to have any hope of the title and the Williams just wasn’t quick enough to beat Hamilton. Lewis Hamilton won the race and the championship, the 15th championship won by a Brit, making Hamilton only the fourth British man to win multiple championships, only Sir Jackie Stewart has three. After turn 1 it was fairly obvious Hamilton would win the title, and once Rosberg started to slow is was virtually guaranteed. Towards the end it looked like Felipe Massa could well steal the win and win his first race since the 2008 Brazilian GP, when Hamilton won his first title, but as he got closer and the race drew to a close he just couldn’t close in enough. Valtteri Bottas took third place and Daniel Ricciardo, despite starting from the pit lane, finished fourth and set the fastest lap of the race. The 2014 Abu Dhabi GP was the first double Williams podium since Monaco 2005, almost ten years, Williams are back. Caterham returned to the grid in Abu Dhabi and gave the young Brit Will Stevens his F1 debut, he qualified and finished last, not a spectacular debut, but not really a surprise either. 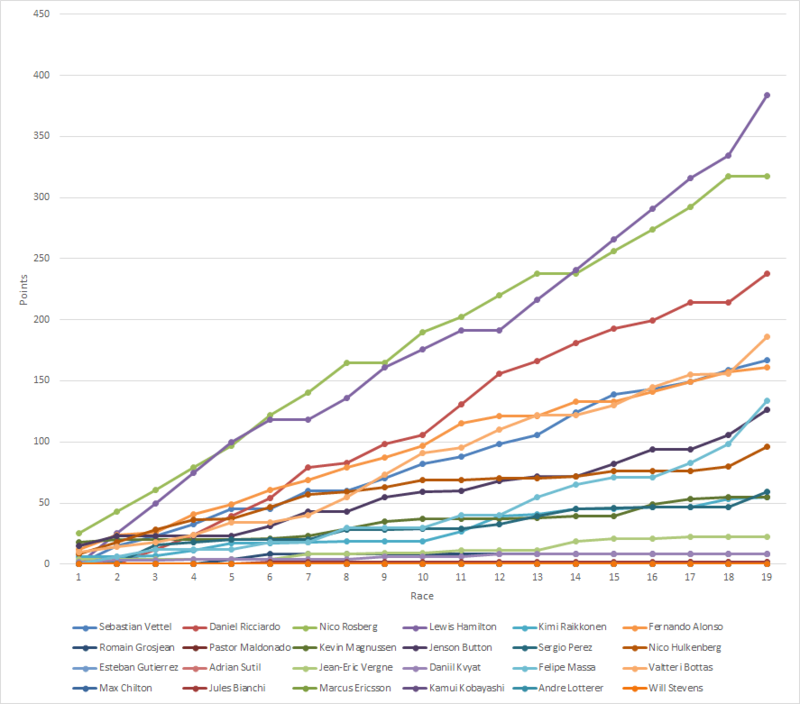 A few changes, Valtteri Bottas pushed back up to fourth, dropping Vettel to fifth and Alonso to sixth. Fellow Williams driver Felipe Massa also moved up in the championship, up one position to seventh, dropping Button to eighth. Finally Sergio Perez moved up two positions to tenth, dropping Magnussen to 11th and Raikkonen to 12th. 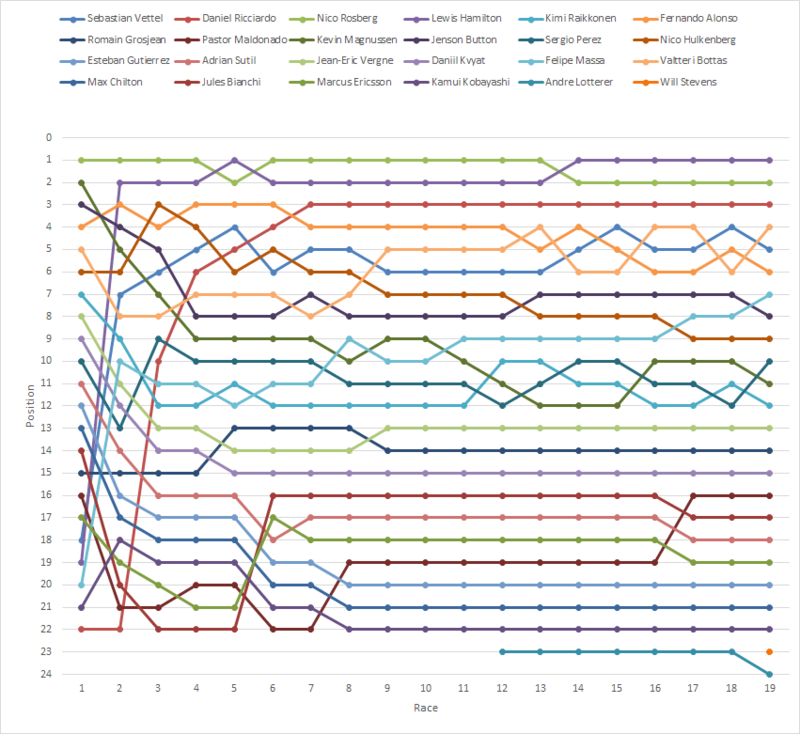 Both Williams drivers moved up positions, both Ferrari and McLaren drivers moved down.